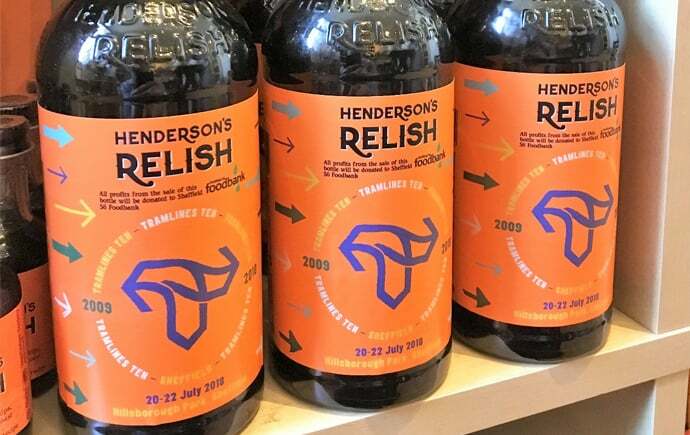 Henderson’s Relish has announced a limited edition bottle of Sheffield’s favourite condiment to mark the 10th anniversary of Tramlines festival, with all profits going to the Sheffield S6 Foodbank. Henderson’s Relish general manager, Matt Davies, said: “We are celebrating 10 years of great music at Tramlines in Sheffield, and raising money to help people in our city who are in crisis. The Sheffield S6 Food bank has been chosen as the charity to receive all profits from the sales of these limited edition bottles of Henderson’s relish, which will be available at independent retailers in Sheffield from 2 July. The S6 Food Bank provides an invaluable service to those people in Sheffield in crisis. It is serves 5,000 people in need and uses 70 tonnes of food per year across 4 Sheffield locations. Donations from the Tramlines Henderson’s bottle will help to support a great cause which helps so many people in Sheffield during their time of need. Head over to the Henderson’s Relish website for more information.